Powerlifters compete in three events -- the bench press, squat and deadlift. The goal is to lift as much weight as possible for one repetition for each exercise. The only upper-body-dominant exercise is the bench press, one of the most well-known exercises for the chest. 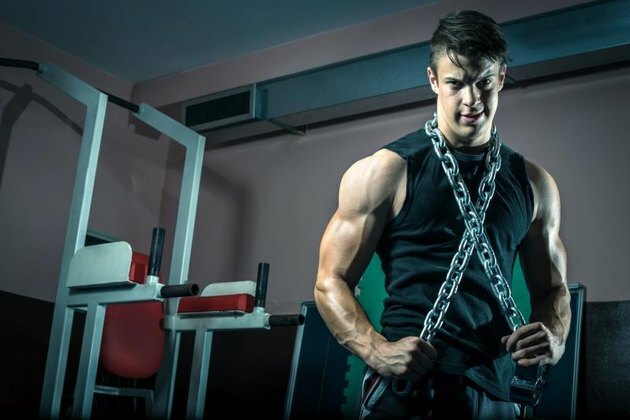 Powerlifters have some of the best no-nonsense training methods for training the chest because it's such a critical muscle in the bench press. As one of the main three exercises in powerlifting, and the only strictly upper body exercise, the bench press should take priority in your upper-body workout. The main goal with training your bench press is to get stronger by lifting more weight, since the goal of a powerlifter is to lift as much weight as possible for one repetition. Your powerlifting bench press training should revolve around lifting near your maximum with few repetitions to increase strength. Aiming for a low number of repetitions allows you to use more weight. To put it simply, you can use more weight in a set of five repetitions than you can in a set of 10 repetitions. Perform between one and six repetitions per set, and between three and six sets per workout, when your goal is to build strength. Lie down on a bench with a barbell securely resting in a rack about an arm's length above. Plant your feet flat on the ground. Grab the barbell with your hands a little more than shoulder-width apart. Pinch your shoulder blades together and stick your chest out. Lift the barbell out of its place and hold it above your chest with your arms straight. Slowly, with control, lower the barbell to your chest. Tap it lightly against your chest. Press the bar back up in a straight line until your elbows are straight. After the bench press, move on to what powerlifters call "accessory" exercises. The main exercise is the bench press and the accessory exercises will help you train muscles that play a critical role in the bench press, mainly the chest, shoulders and triceps. These exercises will further develop the chest muscles. Both exercises are a variation of the fly, an exercise that involves bringing your arms across your torso, almost like a bird flapping its wings. You can use higher repetitions on these exercises because they are designed to help you build muscle, whereas the bench press was used more to strengthen them. This exercise targets your chest muscles without tiring many other muscles. However, Max Gordon, a certified strength and conditioning specialist, warns that you should only perform these if your shoulders are healthy and you can feel a contraction in your chest muscles. Perform three sets of 10 repetitions. Grab two dumbbells and lie down on the bench with the weights in your hands. Press the dumbbells up towards the ceiling until your arms are straight. The knuckles of your hands face out to the side so that the dumbbells line up parallel with your body. With your elbows only slightly bent, slowly lower your arms out to the side. Keep going until the dumbbells are as low as your shoulers. Don't let the dumbbells go lower than the bench. Without bending your elbows, press the weights up and bring them together at the top to complete one repetition. This sliding push-up variation mimics the dumbbell fly and targets the chest by forcing you to bring your arms together. Perform three sets of six repetitions on each side. Get into a push-up position with a slider under your left hand. The slider can be a ValSlide or a towel if you're on a smooth surface like hardwood. Slowly descend into a push-up. Slide your left hand out to the side with your elbow bent. Once you reach the bottom of the push-up, slowly slide your left hand in and press straight up with your right hand until you are back at the top of the push-up position. Manipulating Resistance Training Program Variables to Optimize Maximum Strength in Men: A Review. What Muscles Does the Pec Fly Machine Work? What Muscles Do Triangle Push-Ups Work?